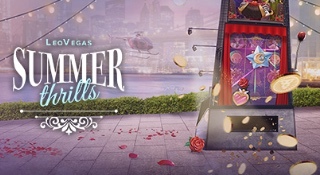 LeoVegas Casino presents Summer Thrills with free spins and bonuses! August is here – and even though that means the end of vacation for most people, the summer party is still going at LeoVegas Casino! This month, they are serving out prizes fit for royalty, including five trips tp New York – which include a moonlit helicopter tour of the Big Apple, cash and more! Come fly with LeoVegas to NYC! Five once in a lifetime trips to New York are up for grabs through a live draw. All you need to do in order to enter the draw is to play the Summer Thrills Games at LeoVegas Casino. You will earn one ticket to the draw for every €50 you play through until midnight on the 21st of August. The live draw will take place at 6pm on the 22nd of August at the Celebrity Blackjack Party Table in the live casino! In addidion to the New York-draw, there are pleny of other offers on the table in August. Every Monday, if you play through at least €50 on the Summer Thrills Games, in addidion to the draw ticket you will also earn one ticket tp the Tuesday Draw. This will take place the following day, and 10 players will be chosen at ranfoom and each given €1000! On Thursdays, you can get a 50% casino bonus up to €100, if you make a deposit of €10 or more. And finally, on Sundays, a suprise amount of free spins will drop every week. The free spins will be available on the given week’s chosen mystery game, fom thw Summer Thrills collection! Golden Ball roulette race at Mr Green Casino!